The Holy Spirit Church is a late-Baroque edifice raised in mid-18th century as an Evangelical church. Its creation is closely connected with the religious unrest in 1724, as a result of which the local Lutherans lost the Church of Blessed Virgin Mary, which they previously owned. Deprived of any place of worship within the Old Town, only in 1754 did they receive a royal permit to build a humble house of prayer which was not to resemble a church in its external appearance. In two years’ time the large church of the Holy Trinity was erected on the site previously occupied by several houses. The architectural design was prepared by Effraim Schroeger, who later gained prominence as the leading architect of Polish Classicism. In accordance with the conditions set for its construction, the church did not have a tower – the one that we can see today was added at the end of the 19th century. 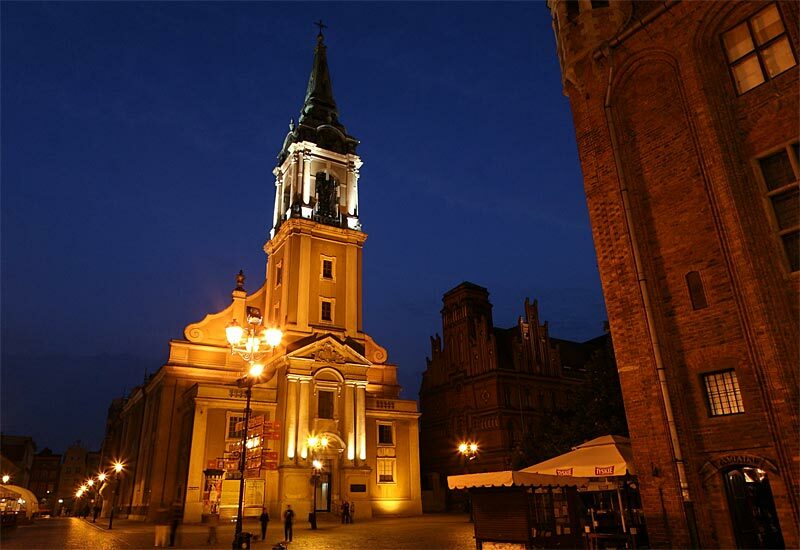 The church was used by Protestants until 1945 when it was taken over by the Jesuits and became the so-called academic church frequented by the staff and students of the Nicolaus Copernicu University.